Eduard Luan Sinaj, born on 29 June 1966, Tirana, completed during 1980-1984 period the Arts Lyceum “Jordan Miss” of Tirana in the branch of Painting. In 1985, he started working as an expert of art mosaics at the Center for Realization of Art Works (QRVA) in the sectors of mosaics under the headship of Mr. Agim Nebiu. In the meantime, he participated in realization of several mosaics realized by this center, such as Museum of Tropoja, Museum of Borova, Rreshen Hotel (today the seat of Catholic Church), facade of Agricultural University of Kamez, etc. After 1990-ies, with the democratic changes and opening of borders, foreign investors arrived in Albania, and he works as a master of mosaics for completion of different commissions for Italian and local clients. In 1994, he establishes the first studio in Tirana for production of art mosaics destined for the local and foreign market (mainly Italian). In early 1997, he attends a 8-month specialization in Italy at a mosaic studio in Salerno (Cava Dei Tirreni). At the end of 1997, he returns to Albania and starts working for the Albanian Orthodox Church and at the same time is specialized in the field of Byzantine mosaics. In the course of this period, he completes a considerable number of mosaics in facades and floors of 9 churches (3 Cathedrals and 6 Churches), under the auspices of Archbishop Anasthasis. 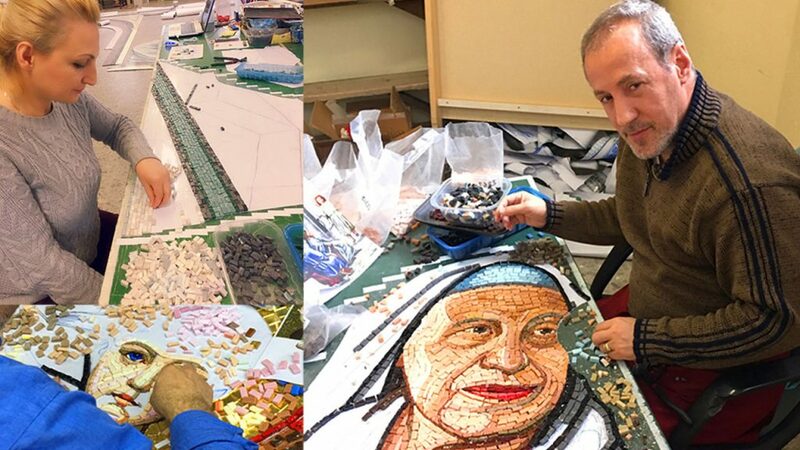 In 1999, he cooperates with Albanian Caritas and at the beginning of 2000, he establishes the new studio for realization and creation of mosaics with the help of Albanian Caritas and director Don Segundo Tejado personally. He completed the higher education studies in 2013-2015 period at the University of Arts of Tirana in the branch of Monumental Painting. In 2007 this art studio introduces the genre of paintings with the entry of his spouse Albana Keraj Sinaj, who has completed the studies at the Academy of Fine Arts in 1996. She has an experience as a film painter after the studies and free-lance painter until 1999 and then an about 8-year experience in Rreli Studio as an expert of art photography and photo editing. Participant in different collective and personal exhibitions with her father – the distinguished Shkodra painter Jakup Keraj 1996. 1998-Participation at the National Exhibition in GKA Tirana, painting. 2007-Studio Sinaj with mosaic and paintings in collective exhibit at Giovinazza BA, Italy. 2011-Studio Sinaj Studio mosaic and painting at the National Museum of Tirana. 2012-2013 participation at the International Exhibition in Turin by ARTE CITTA AMICA with painting. In 2017, Studio Sinaj makes significant steps forward and a transformation in their gamma of products with the introduction of artistic stained glass mosaic after attendance of an intensive course at the Riacci Academy in Florence. During the period of unification of two artists, the studio develops also painting where were realized many paintings such as mural, as well as cavalletto painting in several churches in Albania and Kosovo. This period marks the completion of numerous works in Albania, Kosovo, Italy, USA and participation in collective and personal exhibitions in the capacity of the Studio. With a 30-year experience, Studio Sinaj has completed tens of art mosaics of different dimensions and difficulties for 40 Catholic and Orthodox Churches. At the same time, it realized also many art mosaics with free themes for homes, bars, offices, institutions, etc. This studio aims at realizing art works in these three genres according to the desires and requirements of art lovers. Taking into consideration this great work, with the help of Albanian Catholic and Orthodox Church, their love for the beautiful art of mosaic painting and now with stained glass continuous projects enabled further development of this art in Albania and wider.